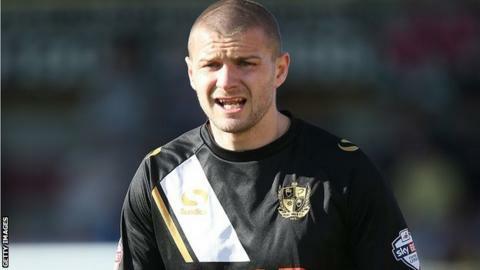 Port Vale captain Carl Dickinson says any fans who are criticising the League One club need to "shut up and get behind the team". Vale are currently four points off the play-off places in 13th, but have lost two of their last three matches. "To be honest I don't know where the negativity comes from," Dickinson, 28, told BBC Radio Stoke. "Fair enough we've lost a few but we're four points off the play-offs, just shut up and get behind the team." Dickinson added: "If you'd offered any Vale fan that at Christmas, they'd have shaken your hand. "It's stupid and there's no need for it, why can't everyone just come along and enjoy it?" Port Vale won a five-goal thriller at the Ricoh Arena in March 3-2, to claim their first victory at Coventry since 1963. Vale, who are currently up for sale, can close the gap on the top six if they can beat promotion-chasing Coventry City on Boxing Day. And Dickinson, who had a loan spell with the Sky Blues in early 2013, says there is no reason why they cannot repeat their win at the Ricoh Arena last season. "They're a massive club and have been doing really well," Dickinson said. "They've got good players but I think we can go there and cause an upset - like we did last year. "It's an exciting game to play - we need to find that balance in consistency."